Filiz Ahmet - Magnificent Century has turned out to be my fate. Filiz likes neither to be interviewed , nor to be shot –although it has been long time since she started acting. But she has come to accept the fact that she must get used to this all . 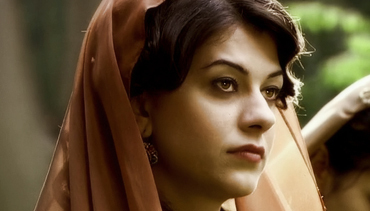 After all, she is Nigar Kalfa , who sometimes outshines Hürrem. Perhaps , even the people who are closest to Filiz don’t call her by name, anymore. Nigar Kalfa of MY has inherited her talent from her family. Her life , which began with acting since she was very young , is quite an interesting one. It is consists of turning points and happy endings. But it also consists of painful memories . She asked us not to write about those latter, as she did not want to create more drama. Your becoming an actress is not a coincidence, apperantly. Your family is also related to theatre. Your grand father was a famous actor in Macedonia and your mother is a prompter. My grandfather’s career was very important as he was the co -founder of the Macedonian-Turkish theatre. I was 6 when I first appeared on stage. It was the first time I knew how it felt to be on stage. Since then , I have loved acting and believed that I was going to be an actress. One important aspect of this is the fact that -our theatre was the first Ethnic Minority Theatre , in the world. It is 60 years old now.And I feel it my duty to protect its continuation. Did you keep your interest in theatre , after coming here? Nowadays ,I cant keep track of all the news . But never lost interest. I have been here for three years and took part in the same plays again and again. Never starting a new play. I have been isolated for sometime and I do miss theatre. If I have the chance, I may restart acting in summer. What is the mission of the theatre? As the Ottomans had reigned there for 550 years, there existed many people of Turkish background. Due to the World Wars, they left the country .Only a few families were left behind. We tried to keep the theatre alive , so that we could keep the Turkish culture alive. We are still striving to do so . There exist various problems. Now we are using the same building with the Albanian theatre. We aim to get out of there and start a new theatre of our own. At first we weren’t provided with space , place , later we were. Then , there were financial problems. If possible ,we are hoping to lay the foundations of it , next year. Elveda Rumeli (Farewell to Balkans) has changed your life. Were you expecting a role? I wasn’t. Ertan Saban was effective in my taking part in Elveda Rumeli. He is acting in Turkey now. He is a close friend of mine. He often called me and said : There is this role in Turkey , I have given your name. You must come and join the auditioning. However, I felt a little nervous in front of cameras. I didnt like them . Theatre used to be my excuse for refusing. By the way I was busy too. My schedule was rather full because of the plays . Yet , the team of the show came to Skopje and we met. First I declined it then I decided to break my taboo and accept it. It turned out to be good. It was only the beginning. Were you aware or the effect the show caused in Turkey? Not much. The audience of our theatre knew about me. But people there dont get excited when they see a famous person. Yet, nowadays they are also starting to watch soap operas and I see them getting excited. Previously , I knew nothing about this. When I visited Turkey , I saw people observing me. I was surprised. But now I’m accustomed to this as I have been in İstanbul for 3 years. What was the nature of your bond with Turkey , before coming here ? How often did you visit Turkey? Since my infancy , we have visited Turkey every summer. We have got relatives in İstanbul and İzmir. My family speak Turkish, but with an accent. But that accent was helpful I think. The audience loved it so much. In Elveda Rumeli , I spoke the very Macedonian Turkish dialect. I use it in MY , as well. I don’t know what will happen in a third project. Was MY all of a sudden? They called me once. I said OK. Then it was delayed. Then it got canceled for several times. They could not find the –right Hürrem. We talked about financial issues and timing. Then MY turned out to be my fate. Financial issues must be important. You were coming to reside in İstanbul after all. Did you have hesitations ? Whenever I visited Turkey , I had a feeling that I could not survive in İstanbul. Because Skopje is smaller and more comfortable. Everything is at your reach. I’m used to leading a relaxed life. So , I was worried. What kind of problems did you face , when you came here? I used to have a crisis once in a month. I missed my family. It was the first time I was away from my family. I felt lonely. Did those problems effect you negatively in the backstage ? I locked down all my problems when I was in the backstage. Those problems belonged to Filiz , not Nigar. When I take off my coat, I leave Filiz behind. Because when I wear those costumes the audince expect to see Nigar . They are not curious about the problems of Filiz. We were tought so , in the very first lesson we had. Thus , I was able to suceed in this. But when I came home , the topic was different. After 6 months passed , I got used to it. My family and friends often visited me. Ertan told me that- “ You are destined to suffer from this at first , but later you would form a strong attachment here. It seems he was right . When I go to Skopje , I miss İstanbul . I want to return to İstanbul in 2 weeks. I can’t understand the magic of this. Your childhood coincides with the Civil War in the Balkans. You must have suffered a lot , during that time. There was turbulance all through Yugoslavia. My family decided to go to Sweden. When we returned home , I was 12. In those times , I could not fully understand about the tragedy of the war. But now I do. Normally , Turks don’t have problems with the Macedonians but we were somehow affected. For example , in -I think 1994- there was a curfew. We resided in the 13. floor. I could see the bombings around the mountain. We hoarded many pounds of rations , because of the war. Since then , hoarding became a habit for us. When my family go shopping , they buy much more then they need. This is probably one of the the results of the war. What kind of childhood memories do you have-set in such a the war zone ? I was living my teenage years. I wanted to go out but I couldn’t. The war always interfered with it. I didn’t know that I would have a love affair with Pargalı. What did you know about the Ottomans when you signed with MY ? I didn’t know much about it. When it comes to Atatürk , I know a lot. Because I am a big supporter of the principles of Atatürk. We have been raised so , since my grand father. I knew some-about the Ottomans. But since I started taking part in MY , I searched it comprehensively. Now I’m better at the subject. What did you think of Nigar Kalfa when you first read about her ? At the beginning Nigar Kalfa was almost nonexistent. Nothing had been written about her even in her character analysis. Besides , I couldn’t find anything about her on the web. After this , I got relaxed. If there was to be no analysis , then I thought I must create her. I formed a a character in my mind. There wasn’t any plan about the love affair between her and Pargalı. It was probably because the audience loved these two characters and thought that they are well suited. I tried to build her character on my own. Macedonian people are proud of me. After MY was broadcast in Macedonia , what kind of treatment did you receive from the audience in Skopje ? Of course the people of Macedonia are proud of me. It is almost they will build a statue for me. I get big support from them. I’m glad to do something good for the name of Macedonia. Is MY going to end ? I don’t know much about it. From press , I heard that there were some controversies. But I’m not interested in them. My job is to act my role.